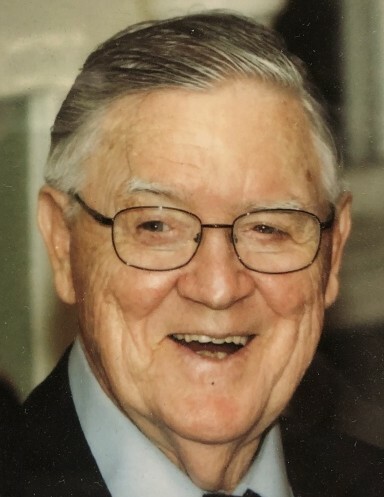 Thomas M. O’Malley, 84, of Montoursville, passed away Thursday, September 13, 2018 at Valley View Nursing Center, Montoursville, surrounded by his loving family. Born October 20, 1933 in Orange, N.J., he was a son of the late Thomas Francis and Agnes Brigid (Feeney) O’Malley. Tom married the former Lois L. Simmons on September 21, 1957 and together they shared 60 blessed years of marriage. Tom was a 1951 graduate of Seton Hall Preparatory School in New Jersey where he played on the Essex County Basketball Championship team. He served his country proudly in the United States Army where he was a military police officer. Tom retired from Liberty Mutual in 1992 after 41 years of employment as a credit manager. Tom was a member of Our Lady of Lourdes Catholic Church. He was a member of White Deer Golf Course and played in the retiree’s league. Tom was a youth sports coach and volunteer for many years. He was a sports enthusiast and enjoyed attending all of his grandchildren’s activities and sporting events. Tom will always be remembered for his outgoing unique, sense of humor and for being a practical joker. In addition to his wife, he is survived by four children; Sharon Marie O’Malley of Montoursville, Thomas P. O’Malley of Montoursville, Kevin M. O’Malley (Annette) of Stroudsburg, and Brian S. “Gus” O’Malley (Wendy) of Montoursville; 11 grandchildren, Erin, Brendan, Shane, Meghan, Bridget, Corey, Adam, Noah, Sean, Kirsten and Lauren; a brother, Patrick Joseph (Betty Anne) O’Malley of Little Egg Harbor, NJ; nieces and nephew, Christine, Patrick “PJ” and Colleen; a great niece, Faith and a sister-in-law, Laura Smith. In addition to his parents, he was preceded in death by a sister, Marie McDonough. A Mass of Christian Burial to honor the life of Tom will be celebrated 10:30 a.m Tuesday, September 18 at Our Lady of Lourdes Catholic Church, 800 Mulberry St., Montoursville with the Rev. Michael S. McCormick, officiating. Burial will follow in Resurrection Cemetery with military honors being accorded by the Korean War Veterans of Lycoming County. A viewing will be held from 6-8 p.m. on Monday at Sanders Mortuary, 821 Diamond St. Williamsport.